NEW YORK (AP) — A new contract reportedly would allow Peter Chernin, president of media conglomerate News Corp., to leave without notice for the top post at a publicly traded competitor. 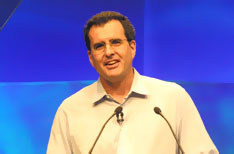 Chernin, 63, has been mentioned as a possible successor to Michael Eisner at The Walt Disney Co., when Eisner steps down as expected in 2006. The contract says Chernin must give six months' notice and have the consent of News Corp. CEO Rupert Murdoch if he wants to leave to head the entertainment arm of a parent company — such as General Electric Co.'s NBC Universal. But The Wall Street Journal reported on its Web site Thursday that the contact was designed to allow Chernin to quit without notice if he takes the top job at a competing company that is public by itself, like Disney or Time Warner Inc.
Chernin's salary drops from $8 million to just under $4 million under the new deal, but he has the potential to earn much larger bonuses — up to $25 million per year, based on the company's performance. News Corp. is the parent of the 20th Century Fox movie studio, the Fox television network, Fox News Channel and various other cable channels.